Once again I am amazed by an artist’s generosity. 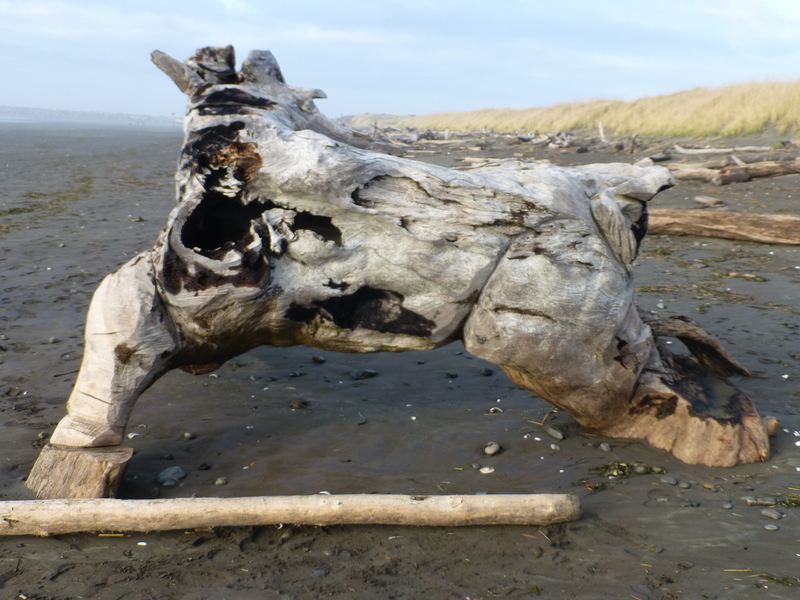 How many hours did it take to turn this chunk of driftwood into a piece of art that is doomed to end up back in the ocean? 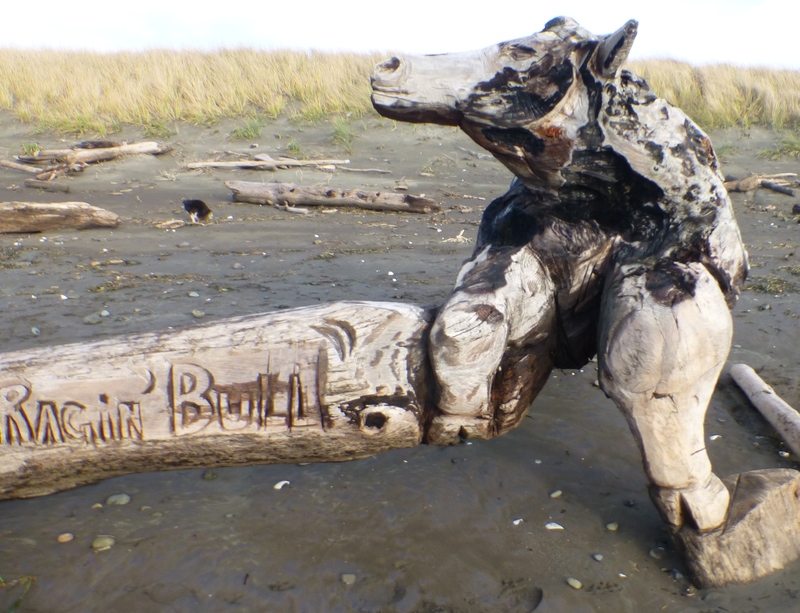 Categories: Phall Photos | Tags: artist, beach, bull, carve, driftwood | Permalink. That is so awesome! Just read the Goodreads review – it’s great! Thank you so much! You are very welcome and glad you liked the bull! I have 2 Taurus sisters who will like him too. Lovely. The bull doesn’t look raging to me, despite the artist’s name. I see it sniffing the sea air, longing to return there or somewhere. Perhaps a dying beast gathering another whiff of life. Beautiful serene face and, yes, a generous artist. Thanks for capturing and sharing this image. Somehow seems right for you to be back on the beach again. I hope it feels right to you. Oh, yes, Elaine, I needed my beach. I agree with your assessment of our bull also. He was not raging at all. I think he wanted to know why no one told him about the ocean before! I’m a Leo, like the artistry of the bull, but agree with Elaine about the name. How beautiful. I am reminded of the fantastic sand sculpture artists whose creations are swept back into the sea on the next high tide, but give so much pleasure to those who happen by. That is truly art for art’s sake without any real desire for recognition. I have a driftwood table with a glass top on my back porch. I wouldn’t trade it for any piece of furniture in my house. Thanks for sharing. You seem to fit right where you are! There is something serene and soothing about exploring what the sea has to offer. I posted a photo last spring of a sand carved face in the dunes…it was so beautiful…lasted longer than a sand castle on the beach, but still, not very long. I’ll try to post it on FB later. Yes, I am in the right place for me for now. Our culture is generally so used to the idea of conserving art that it really seems odd to us to see art that is temporary. I’m thinking of Native American sand art. Thanks for this, Patti! H could have trucked it home. Maybe he wanted to do somethng that would wash away. Some people like ephemeral (there’s that word again) art … its temporariness makes it that much more valuable. Yes, it went way up in value to me, compared to if I saw it at a shop. And unless the artist was called “Raging Bull,” there was no signature or stack of business cards in sight. It would take considerable man and machine power to move this. The force of nature will eventually reclaim it though. what an incredible piece of art – stunning! I’m glad you appreciate it. The artist obviously “saw” the bull, then made very few cuts to bring him out for us all to see. I agree and I am so glad that I was at the right place at the right time!